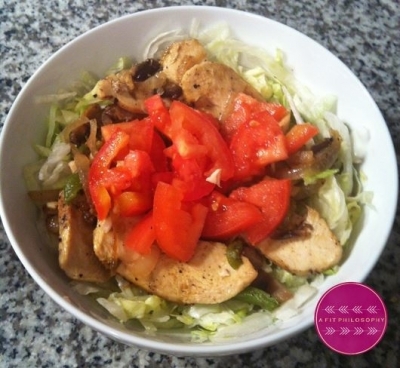 Cook chicken breast in a pan, slice thin, and set aside. Combine yellow onion, green pepper, sliced mushrooms, and black pepper, sautÃ© in pan with cooking spray until done. Add sliced cooked chicken to pan with vegetables and mix together. Put Chicken Philly mixture in a bowl over shredded lettuce and top with sliced tomatoes!